HomeWorld NewsTTIP Transparency in Practice — No acces! 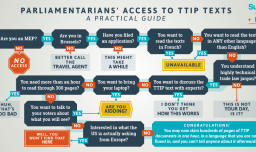 TTIP Transparency in Practice — No acces! TTIP or no TTIP — our representatives in the European Parliament (MEPs) will play a crucial role when it comes to deciding whether this historic trade deal between the US and EU will become reality. With our democracy on the line and our health and environmental standards up for negotiation — it couldn’t be more vital for our MEPs to know exactly what they’ll have to decide on. EU Commissioners say they’re giving access to MEPs, but we know it’s just not true. Share this infographic to make sure people all over Europe understand just how undemocratic this trade deal is.